Kusadasi is the best place for shoppers, with numerous markets and boutiques, as well as the shopping centres you are spoilt for plenty of choices. Those are the type of shops you will see the most of. Definitely you will enjoy the fun of bargaining smiling salesman speaking many languages negotiating for their goods no matter facilities; you will feel at home in Kusadasi. There is Grand bazaar, Orient bazaar, Kusadasi bazaar and all they are full with shops and very close to the harbour in centre. Kusadasi market is held on every Friday and sells fresh fruits and vegetables and on every Wednesday sells reasonable clothes, shoes etc. You can find many fake brands such as Lacoste, Dolce & Gabbana, Louis Vuitton and Calvin Klein in public markets. Kusadasi harbour has many famous brand stores such as Lacoste, Mudo, Cotton, Desa etc. 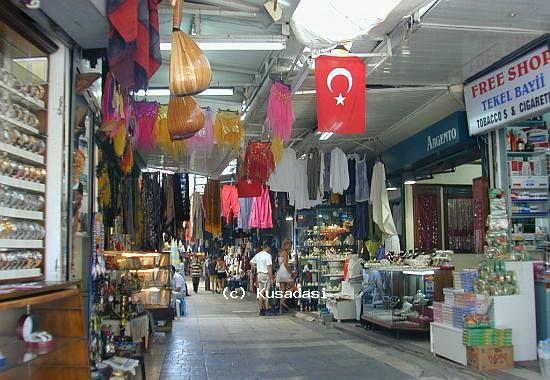 All modern shops are mostly air-conditioned in Kusadası.